Here’s a little story, one two three. Peepo! There are certain well-loved classics that belong on every child’s bookshelf. You know, the stories that are so loved and so often read that your child can recite them by heart long before they ever learn to read it themselves. For my son, that story was Eric Carle’s The Very Hungry Caterpillar. For my daughter, it’s Peepo. 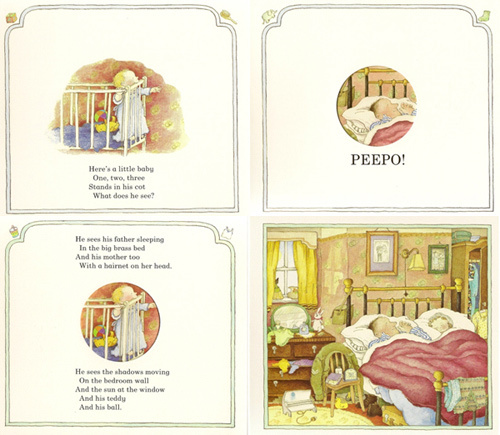 Peepo!, by those doyens of children’s literature Janet and Allan Ahlberg, is a deceptively simple, sweet rhyming tale of a little baby and what he sees as he goes about his day. Here’s a little baby, one two three. Stands in his cot, what does he see? Peepo. And what does he see? A snapshot of life from the 1940s, that’s what, complete with hairnets, coal buckets, army uniforms and – my daughter’s favourite part – a dog at the doorway who shouldn’t be there. This is a book to enjoy on so many levels, from the understated rhyming prose to the intricate illustrations that hide behind every toddler’s favourite part – the peep-hole. We’ve read it so many times in our house that my daughter isn’t the only one who knows the words. I can recite the whole book myself – and often do when we’re caught out in a doctor’s waiting room or some other place where my kids need to be kept quietly entertained. Though sometimes their shouts of “Peepo” aren’t so quiet at all! Find Peepo! 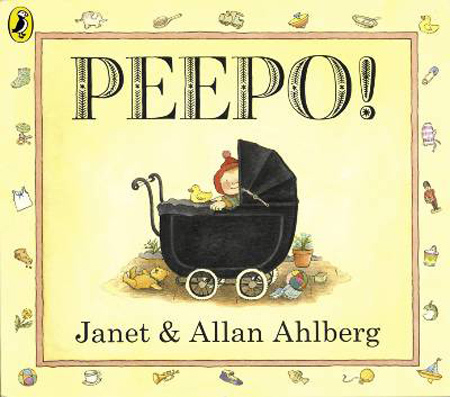 in a baby-friendly board book edition at Fishpond for $8.95 or opt for traditional book format for $9.97. You might also like to introduce your kids to some of the Ahlberg’s other classics, including the brilliant Each Peach Pear Plum, an “I spy” tale for the preschooler set with nursery rhyme and fairy tale characters, and Funnybones, a frightfully funny tale of two skeletons that will tickle the funnybones of just about every little boy.